Injection molding is a process of “injecting” or flowing liquefied plastic resin into a mold. The resin will chemically cure or cool into a hard or rigid plastic object. The mold, called a tool in the industry, must have channels for the liquid plastic to run into the tool cavity, and it must also be designed so that it can be opened to eject the solid product. Using a mold to make solid objects has been done for millennia. Perhaps the most notable are the bronze statues of Greek times and before. The fluid bronze is poured into a form which is hollow, and when cooled the bronze takes the shape of the hollow. This is done by making a wax “positive” of the item, then molding plaster around the positive. The hardened plaster is then heated where the wax positive is melted, leaving a duplicate “negative” void in the plaster mold. The molten metal is then poured into the mold creating a “positive” statue again, but this time in metal. The injection molding process for modern plastic manufacturing is similar to this age-old process. However, it was updated in 1872 by John Wesley Hyatt and his brother Isaiah. They attempted to make billiard balls using cellulose to replace the disappearing elephant tusk billiard balls. In the process, they invented a system that used molding tools that were filled with molten celluloid and then taken apart and reused. Of course, today products are designed by a computer drafting program instead of making a “positive” wax model. Then a metal tool (mold) is made that is the “negative” void. The difference, however, is dramatic. The tool must come apart in such a way as to allow the product to be removed without harming it. In a simple product two halves can be made such as a ball, for instance. In each half, the mold easily slips off the ball, leaving a solid ball intact. However, if you wanted to make most products with much more complex shapes, it may take several pieces that fit together like a three-dimensional puzzle to allow the product to be ejected without harm. To inject the plastic, channels (called a sprue and runners) must allow the flow of material into the void where the part is made. Modern manufacturing must also eject the parts quickly so ejector pins are built into the tools. The material runs from the liquified resin reservoir through the sprue and runners and fills the part voids. 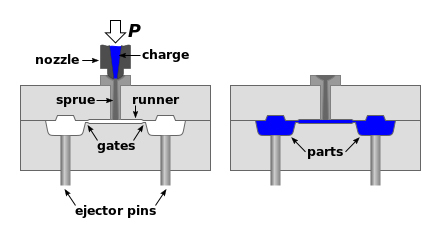 When hardened, the top of the tool is removed, leaving a positive of hardened plastic in the shape of the void and runners. 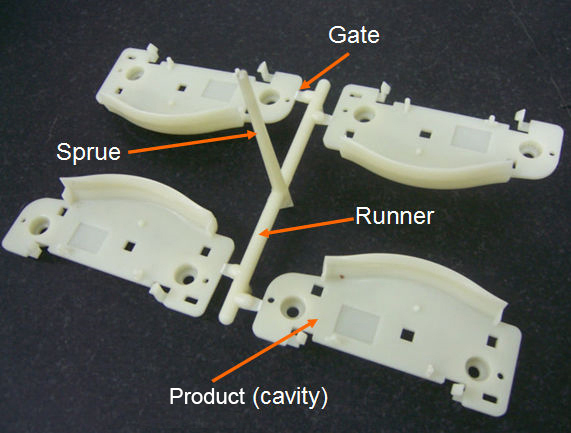 The runners which are attached by “gates” and “sub gates,” small channels that allows material to enter the cavity, must be removed leaving the completed parts. The runners are then recycled. Automated factories use sophisticated machinery to hold the special tools and automatically inject, cool, eject, cut, and move the parts to containers. In this way machinery can continually inject plastic, cure it, separate the tool pieces, eject the parts, and cut the runners. This allows many millions of parts to be made with little human interaction. The process allows many parts to be made very inexpensively; however, the investment in tools and setup can be quite substantial. The investment and setup must be amortized over the quantity of parts made over time. See Microdyne Plastics Injection Molding services here. Very complex shapes require competent engineering design to determine how many tool pieces to use compared to the complexity of the part. When molding is impossible due to complexity, several parts may have to be made into a total product. The trade-off of labor for fabrication and initial cost of tools must be considered to keep the costs as low as possible. Injection molding can be very precise. This makes the method perfect for highly precise medical products, and very small micro precision parts for electronics, automotive and other industries. Products as diverse as toys, syringes, dinnerware, furniture, bins, containers, clock parts, plumbing parts, bottle caps, bicycle helmets, and fasteners of all kinds. Today billions of parts are made using this process. In each case, the product is designed, then tools are made to do the molding, and machinery is used to fill the tool voids and then eject the final product.